Muammar Gaddafi's house lay in a shambles on Monday following bombing by the United States and its allies promoting a debate whether the allies were trying to kill the Libyan leader. While the US insisted that Gaddafi was not a target, Defence Secretary Robert Gates said that his country expects to hand over the leadership of the military operations against Libyan regime to a coalition likely to be headed by either the French, the British or the North Atlantic Treaty Organisation "in a matter of days". Just a few days Operation Odyssey Dawn, the collective international action under United Nations authority to protect the Libyan people, has already derailed Gaddafi's bloody assault on rebel-held territories. But despite its success there was huge concern about the destructiveness of the air strikes. 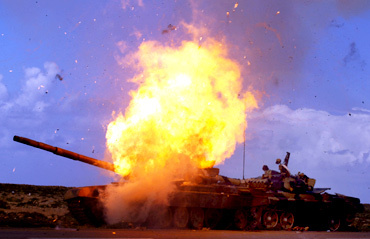 A tank belonging to forces loyal to Gaddafi explodes after an air strike by coalition forces, along a road between Benghazi and Ajdabiyah. 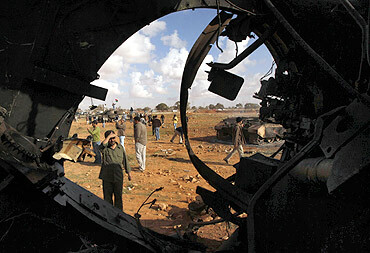 A man looks at a destroyed tank belonging to Gaddafi forces after an air strike by coalition forces, along a road between Benghazi and Ajdabiyah. Western forces pounded Libya's air defences and patrolled its skies on Sunday, but their day-old intervention hit a serious diplomatic setback as the Arab League chief condemned the "bombardment of civilians". 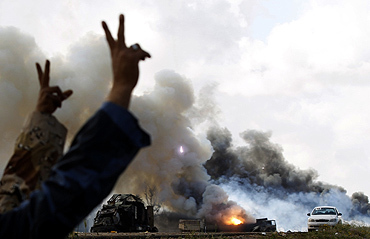 Rebel fighters gesture in front of burning vehicles belonging to Gaddafi's forces after an air strike by coalition forces along a road between Benghazi and Ajdabiyah. Libyan rebels moved their forces near Ajdabiyah after Western air strikes devastated Gaddafi's forces on a road leading up to the strategic eastern Libyan town. 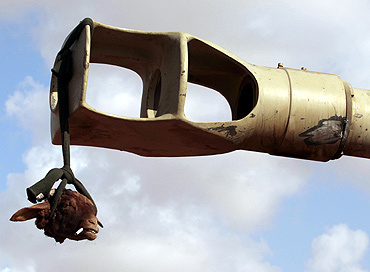 The head of a goat is hung on the muzzle of a destroyed tank, belonging to Gaddafi's men, after an air strike by coalition forces along a road between Benghazi and Ajdabiyah. 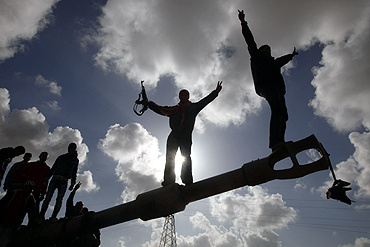 People celebrate atop a destroyed tank belonging to Gaddafi's army after an air strike by coalition forces near Benghazi. 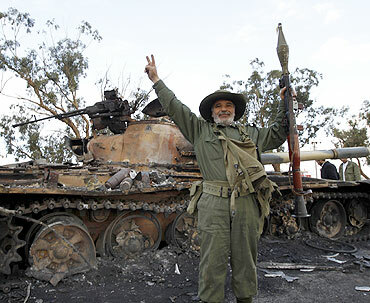 An elderly rebel fighter gestures in front of a destroyed tank after an air strike by coalition forces in Benghazi. 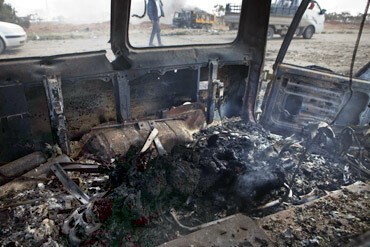 The charred body of a Muammar Gaddafi loyalist soldier killed in what residents said was a French airstrike lies in a burned out vehicle on the southern outskirts of Benghazi in northeastern Libya.The smouldering wreckage of tanks and vehicles that appeared to belong to loyalist forces lined the road south from Benghazi and the charred corpses of more than a dozen fighters lay scattered in the dirt by the roadside. 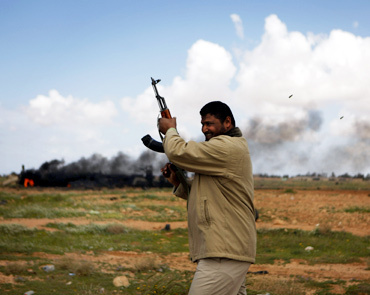 A rebel fighter fires his weapon into the air at the scene of what residents said was a French airstrike against Gaddafi's forces on the southern outskirts of Benghazi. 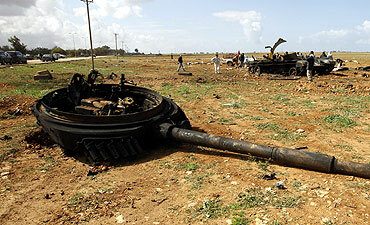 A turret of a tank belonging to Gaddafi's forces is left on the ground after an air strike by coalition forces near Ajdabiyah. 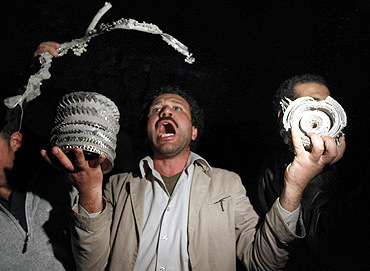 A Gaddafi's supporter shows pieces of shrapnel from what the government said was a western missile attack on a building inside Bab Al-Aziziyah, Gaddafi's heavily fortified Tripoli compound on Monday. 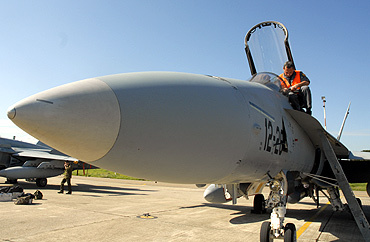 Spanish ground crew work on an F-18 jet fighter plane at the NATO airbase of Decimomannu, in the southern Italian island of Sardinia. NATO ambassadors approved an operations plan for the alliance to help enforce a UN arms embargo on Libya on Sunday, a NATO statement said. 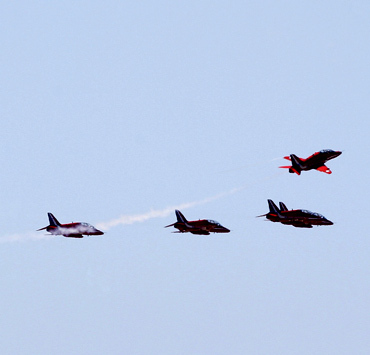 A Royal Air Force Red Arrow display team flies in formation over the Akrotiri Royal Air Force base in Cyprus on Monday. 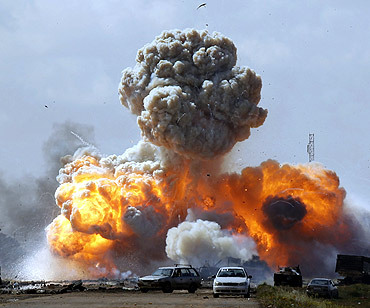 Western forces launched a second wave of air strikes on Libya overnight and officials in Tripoli said a missile intended to kill Gaddafi had destroyed a building in his fortified compound. The Red Arrows train at Akrotiri. 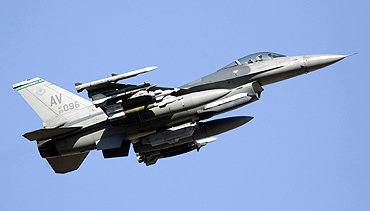 An F-16 jet fighter flies over the NATO airbase in Aviano, northern Italy,on Monday. NATO ambassadors approved an operations plan for the alliance to help enforce a United Nations arms embargo on Libya. One of three Air Force Global Strike Command B-2 Spirit bombers returns to home base at Whiteman Air Force Base in Missouri after striking targets in support of the international response which is enforcing a no-fly zone over Libya. 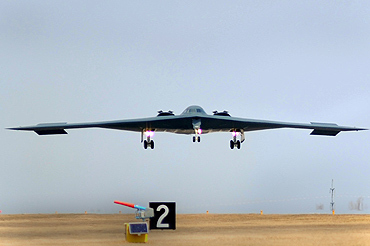 The B-2s landed at Whiteman Air Force Base, Missouri after a more than 25-hour mission in support of Operation Odyssey Dawn. The bombers employed 45 guided Joint Direct Attack Munitions, each weighing 2,000 pounds, against hardened aircraft shelters in Libya. 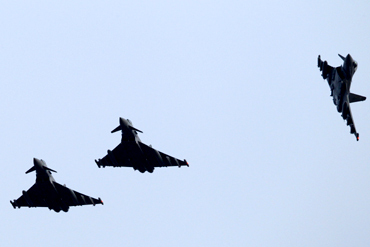 British Eurofighter EF-2000 Typhoon jets fly over the Gioia del Colle NATO Airbase in southern Italy. European and US forces unleashed warplanes and cruise missiles against Libyan targets under a UN Security Council resolution authorising military action to protect civilians from Gaddafi's forces. 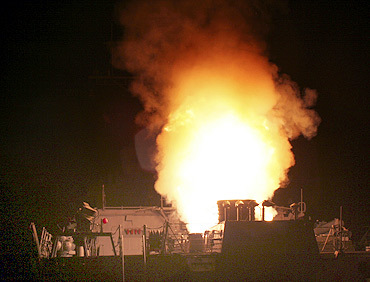 Arleigh Burke-class guided-missile destroyer USS Stout launches a Tomahawk missile in support of Operation Odyssey Dawn in the Mediterranean Sea. This was one of approximately 110 cruise missiles fired from US and British ships and submarines that targeted about 20 radar and anti-aircraft sites along Libya's Mediterranean coast. Joint Task Force Odyssey Dawn is the US Africa Command task force established to provide operational and tactical command and control of US military forces supporting the international response to the unrest in Libya and enforcement of United Nations Security Council Resolution 1973. 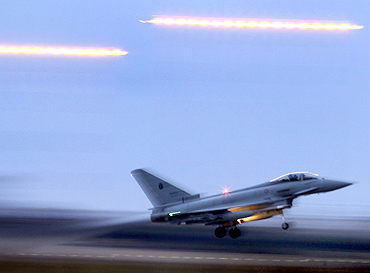 An Italian Eurofighter EF-2000 Typhoon lands at the Birgi NATO Airbase in Trapani in the southern Italian island of Sicily. Italy has deployed dozens of combat aircraft at its base at Trapani, in western Sicily in readiness for possible involvement in airstrikes on Libya. Eight jets have been assigned to the coalition command and are ready to take part in operations immediately, Defence Minister Ignazio La Russa said on Sunday. 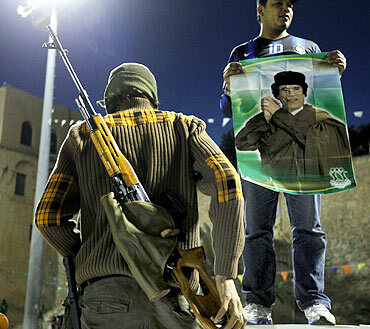 A soldier from the Libyan army loyal to Gaddafi stands at Green Square in Tripoli. 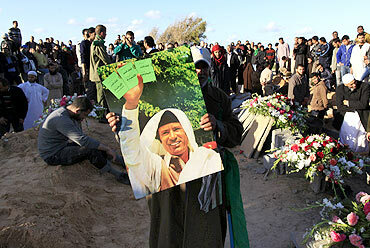 Libyans hold a picture of Gaddafi as they mourn during the funeral of the people who were killed after air strikes by coalition forces, at the martyrs' cemetery in Tripoli. 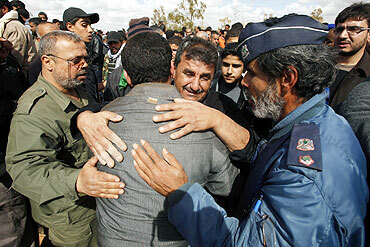 Relatives of a Libyan killed by forces loyal to Gaddafi mourn during his funeral in Benghazi. 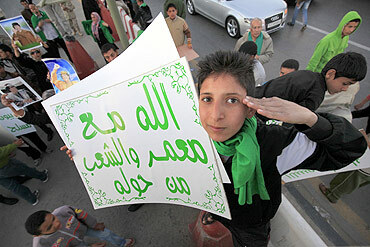 A supporter of Gaddafi holds a sign outside Bab Al-Aziziyah, Gaddafi's heavily fortified Tripoli compound. Thousands of Libyans packed into the compound to form a human shield against possible air strikes by allied forces. The sign reads, "God is with Muammar and people around him". Gaddafi's supporters shout slogans as they stand and sit on a wall in Bab Al- Aziziyah, Gaddafi's heavily fortified Tripoli compound. 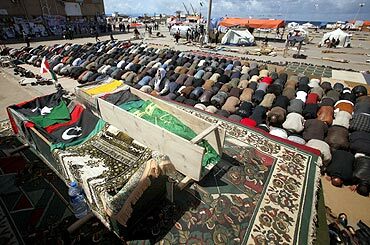 Mourners pray next to coffins containing bodies of Libyans killed by Gaddafi's forces, during a funeral in Benghazi on Monday. Foreign evacuees, who fled unrest in Libya, are seen at a refugee camp near the Libyan and Tunisian border crossing of Ras Jdir.